1. Soak the green peas for 4 hrs. 2. Crush the peas , don’t make it fine paste,there should be something to chew. 3. 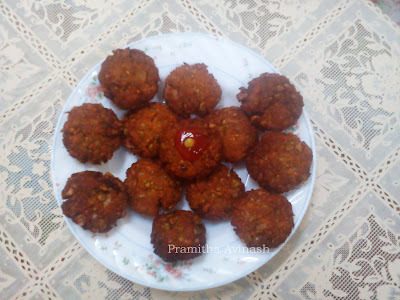 Take a bowl and put all the chopped ingredients,peas,chilly powder,hing and salt.Combine them well with your hands and make small round vadas(don’t make it big size). 4. Deep fry these vadas until crisp in a medium flame. Serve hot peas vadas with sauce.